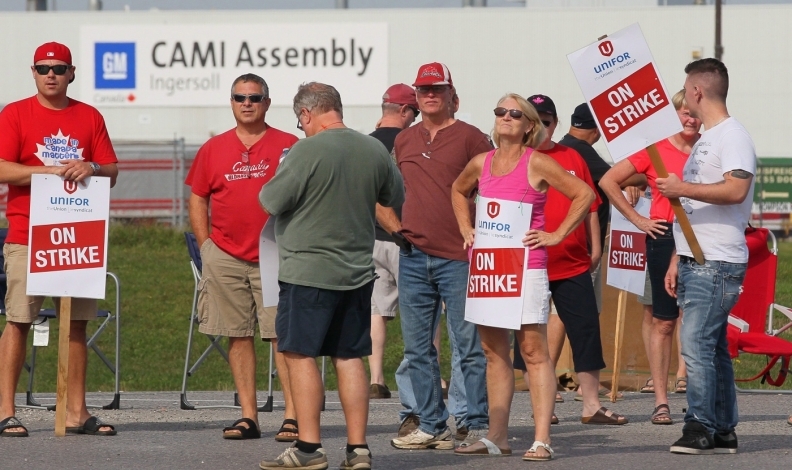 Employees of the GM CAMI assembly plant stand picket in Ingersoll, Ont. The 2,800 members of Unifor local 88 walked out Sunday at 10:59 p.m. when negotiators for the union and the automaker failed to come to terms on a new contract agreement. General Motors and Unifor, the union representing about 2,800 striking workers at the CAMI Chevrolet Equinox assembly plant in Ingersoll, Ont., have talked informally over the phone but aren’t yet back the bargaining table, a union official said. Workers struck the plant at 10:59 p.m. Sept. 17, after the most recent contract expired. Official talks have yet to resume. It’s the first strike to affect a Canadian GM assembly plant since 1996. A five-week strike by the CAW, the predecessor to Unifor, idled the CAMI plant in 1992 and Borthwick said his members are prepared for a showdown of similar length. “We might need a couple pairs of shoes, but we’ll walk,” he said. Borthwick said the current strike is a gamble, but one worth taking. “We believe there is some risk, I’m not going to hide from that. But I don’t think we have anything else we can do. They moved the Terrain to Mexico and there’s nothing in our contract right now that stops them from moving the Equinox to Mexico,” Borthwick said. The main sticking point -- although many smaller ones remain -- is the fact GM Canada refuses to designate CAMI the lead Equinox plant among the automaker’s North American facilities. GM Canada declined to respond directly to Borthwick’s comments. Instead, the automaker re-issued a statement from Sunday night. GM Canada announced in January it was moving production of the GMC Terrain to Mexico from Ingersoll. The move resulted in the elimination of about 600 jobs at CAMI, although about 200 employees accepted buyouts or early retirement. But, because the redesigned Equinox is more complex to assemble than the previous generation, production at the CAMI plant dropped to 40 units per hour, down from 60 units per hour, resulting in needing fewer hourly employees. “We’re at maximum capacity in the weld shop. They’d have to invest in the weld shop if they wanted to increase capacity,” Borthwick said. GM already spent about $800 million retooling the CAMI plant in anticipation of the redesigned Equinox that has been selling strongly in the United States and Canada. Sales are up 17 and 40 per cent in those countries, respectively. While Borthwick said the union was willing to accept the risk a strike presents, he’s confident the automaker won’t easily or quickly move Equinox production to Mexico. “I don’t think they have the capacity down there right now,” he said. Two Mexican plants began assembling the Equinox in April, and GM could ramp up production there during the strike. But by how much is unknown. The crossover is built on a line alongside the Terrain at the Ramos Arizpe plant, which also builds the Chevrolet Cruze and Sonic on another line. GM’s San Luis Potosi plant also builds the Equinox, along with the Chevrolet Aveo and Trax and the GMC Terrain. The two Mexican plants have built 40,017 units through August of this year since production began in April, according to the Automotive News Data Center. CAMI has built 132,288 of the crossovers since the beginning of the year.